There are precious few stars of the 1930s who are still with us today, and it is with sadness that we share the news that Mary Carlisle, born Gwendolyn Witter in Boston, Massachusetts, has passed at the age of 104. The last of the WAMPAS Baby Stars, an annual promotional campaign sponsored from 1922-1934 by the Western Association of Motion Picture Advertisers that honored 13 young actresses (the number was 15 in 1932, the year Carlisle was honored) whose careers showed great promise, Carlisle was discovered in 1928 by studio executive Carl Laemmle, Jr. while dining at the Universal Studios commissary. She was just 14. In 1930, Carlisle signed a one-year contract with Metro-Goldwyn-Mayer, appearing mostly as a dancer in musical shorts, but it was with Paramount Pictures that she would achieve her greatest success. She appeared opposite Bing Crosby in three films—College Humor (1933), Double or Nothing (1937) and Doctor Rhythm (1938)—and would go on to appear in more than sixty pictures in the course of her 14-year career, most of them “B” pictures with titles reminiscent of the early scene in Preston Sturges‘ Sullivan’s Travels, in which successful but artistically frustrated director John L. Sullivan (Joel McCrea) is reminded of some of his greatest successes: Ants in Your Plants of 1939, Hey Hey in the Hayloft, and So Long, Sarong. Some of Carlisle’s pictures could’ve been plugged right into John L. Sullivan’s filmography, titles like Hotel Haywire (1937), Ship A Hooey! (1932), and Handy Andy (1934), and we’d pay good money and line up early to see that triple feature tonight, if only some bijou were screening it. Carlisle was wed to actor James Edward Blakeley (he would go on to become an executive producer at 20th Century-Fox) in 1942 and retired from motion pictures soon thereafter. But more than five dozen pictures is nothing to sneeze at, nor is living (and staying vital) to 104 years of age. What a rich, full life Ms. Carlisle enjoyed. Rest in peace, Ms. Carlisle, and thank you. This story originally appeared in a slightly different form on February 3, 2016. 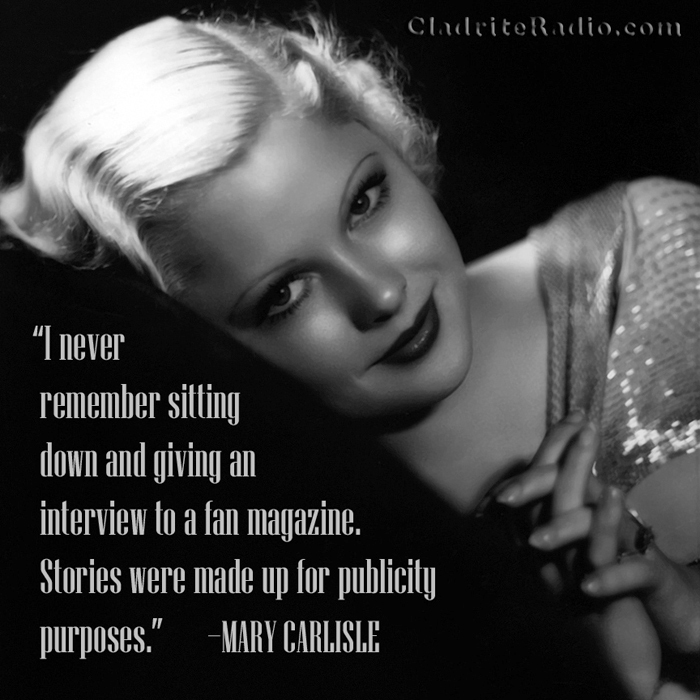 There are precious few stars of the 1930s who are still with us today, but Mary Carlisle, born Gwendolyn Witter in Boston, Massachusetts, 102 years ago today, is still going strong, bless her heart. The last of the WAMPAS Baby Stars (an annual promotional campaign sponsored by the Western Association of Motion Picture Advertisers from 1922-1934 that honored 13 young actresses [the number was 15 in 1932, the year Carlisle was honored] whose careers showed great promise), Carlisle was discovered in 1928 by studio executive Carl Laemmle, Jr. while dining at the Universal Studios commissary. She was just 14. Think some of Carlisle’s pictures couldn’t have been plugged right into that dialogue, titles like Hotel Haywire (1937), Ship A Hooey! (1932), and Handy Andy (1934)? But we’d pay good money and line up early to see that triple feature tonight, if only some bijou were screening it. Carlisle was wed to actor James Edward Blakeley (he would go on to become an executive producer at 20th Century-Fox) in 1942 and retired from motion pictures soon thereafter. But more than five dozen pictures is nothing to sneeze at, nor is being vital and alert at the age of 102, which, by all reports, our Mary is. Happy birthday, Mary! We hope you enjoy a truly grand day!